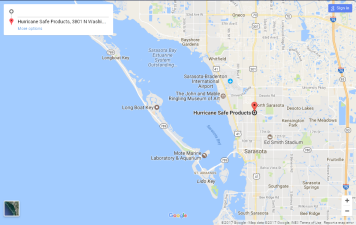 At Hurricane Safe Products in Sarasota, Fla., we recommend the installation of hurricane shutters on your home or condominium, but if must stay at home during a storm, then you should choose clear hurricane shutters. Most hurricane shutters are made from thick metal, so the items won’t permit any sunlight to enter your home, and this is a problem when there is no electricity during a storm. A hurricane can last for several hours or longer, and without any electricity or sunlight, you must use battery-operated lights or candles. However, you can overcome this problem with clear polycarbonate hurricane shutters. These thick plastic hurricane shutters are made in a special way to protect your home’s windows and doors from breakage, but you will still have natural lighting in each room. These types of hurricane shutters offer the same level of protection for the glass of the windows or doors to keep rainwater from entering your home. One of the best benefits from clear polycarbonate hurricane shutters is that the items are lightweight, making the items easier to install and move. Contact us today at 941-351-6700 to learn more.